Before configuring your SAML 2.0 using the instructions presented here, you must have an Okta SSO account (or similar). You can try Okta free for 14 days here. This setup might fail without parameter values that are customized for your organization. Please use the Okta Administrator Dashboard to add an application and view the values that are specific for your organization. Here’s a link to Okta’s instructions on how to integrate eLeaP. Send an email to to the eLeaP Support team at support@eleapsoftware.com including a request to approve/activate your Okta SSO instance. In Okta, select the Sign On tab for the eLeaP app, then click Edit. For example, if you log into https://acme.2leap.com, yoursubdomain is: acme. If you are unsure of what your Default Relay State value is, contact eLeaP at support@eleapsoftware.com. Make sure your Subdomain and Company Name values are entered correctly. 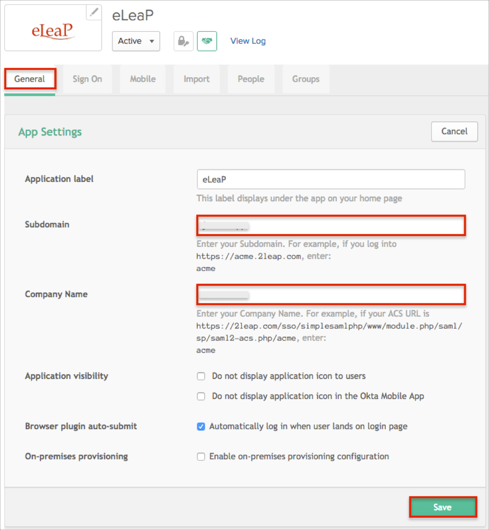 Still in Okta, select the General tab for the eLeaP app, then click Edit. 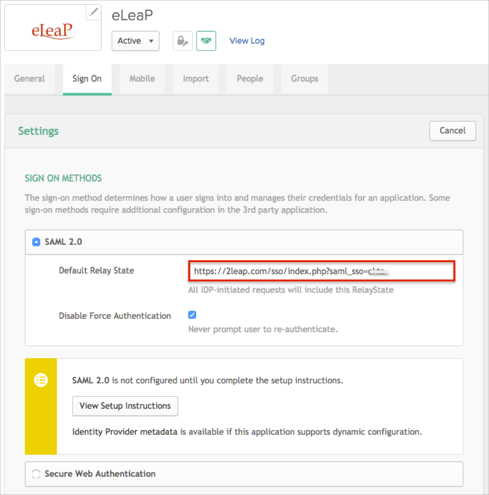 eLeaP will notify you when SAML has been enabled..
SP-initiated flows and Just in Time (JIT) provisioning are not supported. Start your Free LMS Account.